If you follow my Facebook page or YouTube channel, you might have already caught up with my new video series 'A Chic and Simple Christmas'. For ten days I am sharing little tips, tricks and ideas created to help you enjoy a calm and joyful December, when there is so much going on. I thought I would post them here as well, for those of you who don't follow my other channels. Days 1-4 are available to view here, and days 5-7 are here. Below are the final days 8, 9 and 10. I hope you enjoy them, and I'd love to hear your comments or any ideas that come up for you after watching the videos. 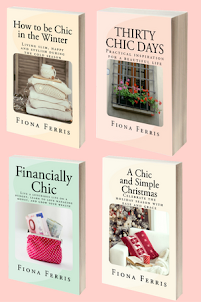 If you would like to read more, see my book 'A Chic and Simple Christmas: Celebrate the holiday season with ease and grace', available on Amazon in print copy and on Kindle. Merry Christmas Fiona & Paul and fur babies. I bought your book(s) and found the Christmas one especially helpful. Thank you for all your wonderful posts during the year and I look forward to what you have to share in 2017. 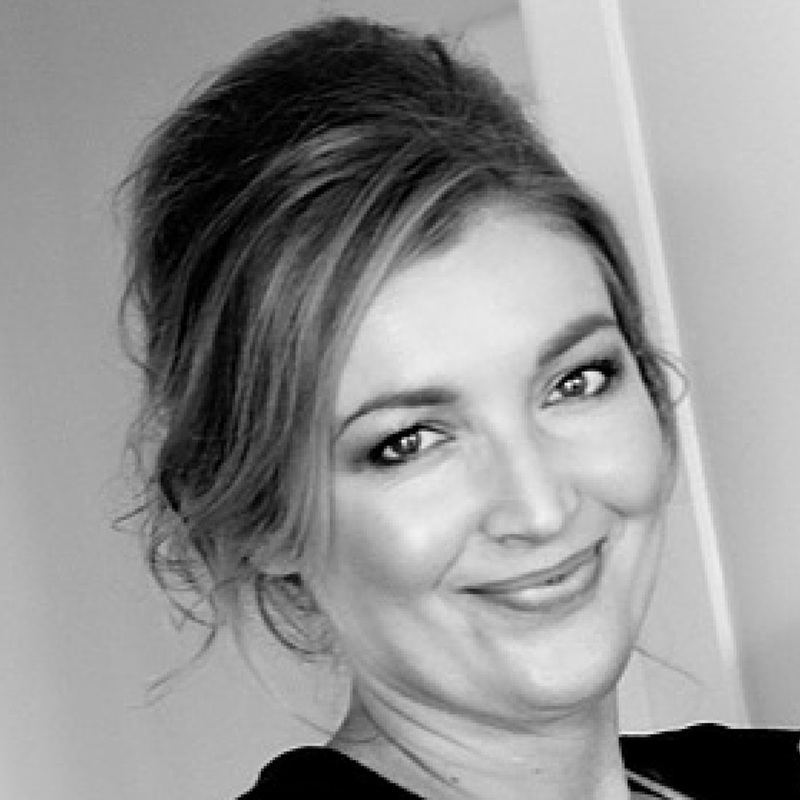 Thank you for your lovely chic blog posts, it is fun to hear and to read your posts about your sensible approach to living a full and luxurious, uncluttered life. 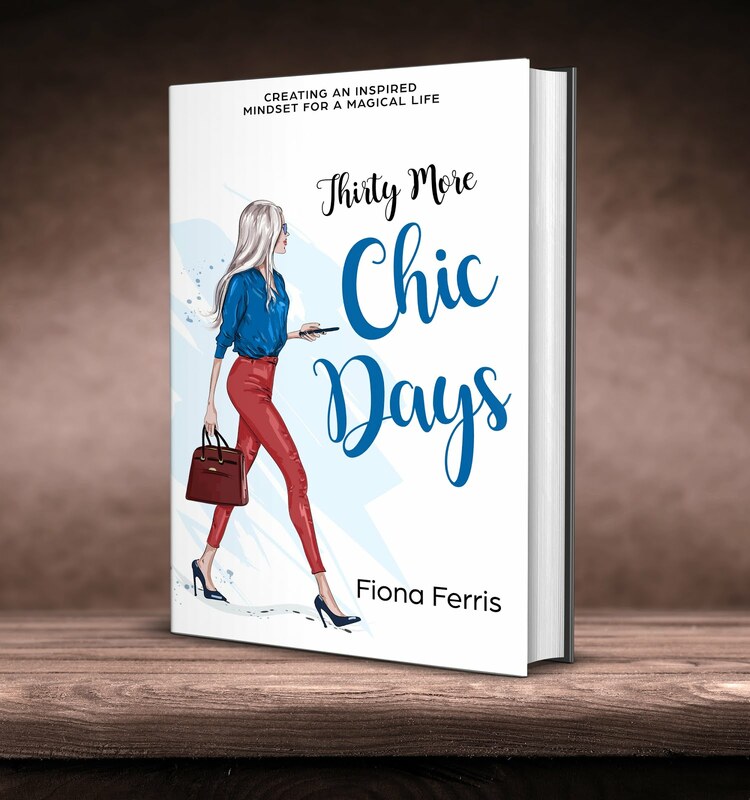 Hi Fiona- Loved your book and videos on creating a chic Christmas. My husband and I treated ourselves this year, and stayed overnight at the Bee and Thistle Inn in Old Lyme Connecticut. (It is a lovely old 1756 Inn.) It was elegantly decorated for Christmas with trees and greenery and had some magnificent gingerbread houses. We enjoyed live guitar music while sitting next to a fireplace sipping "special" coffees that evening, and retired to our beautiful bedroom complete with fireplace, to relax and talk. We enjoyed a wonderful English Christmas tea the next day, with special teas and tea sandwiches and cookies, all while listening to live harp music and admiring the beautifully decorated Inn. What a wonderful husband I have- the tea was attended by all women(he was the only man attending) yet he made that afternoon so special for me and enjoyed it himself in the process. It was a nice change to pamper ourselves for once, after spending so many years sacrificing to make sure we created the best Christmases we could for our three children. We have decided to make some changes, as our children are grown and will be starting to have their own families and traditions, and spend more time together creating OUR own new traditions for ourselves, as well as spending time with our children. We are also preparing food for a soup kitchen our son is working at on Christmas day, and would like to start to be more involved in reaching out to others at this time as well as during the new year. Each of your books, as well as your videos, have provided me with so much inspiration to work on myself, my home, and my life in general. Thank you for helping me to realize that it is not selfish to take good care of yourself, have fun and treat yourself special at times, and FEEL beautiful, as well as live a life filled with beauty. Wishing you and your family the Merriest Christmas and the Happiest New Years! Lorna L.
Your husband does sound wonderful, what a fabulous time you had. I love that you are starting some new traditions for the two of you now your children are grown. I'm so happy my message has been helpful, it warms my heart to hear that! 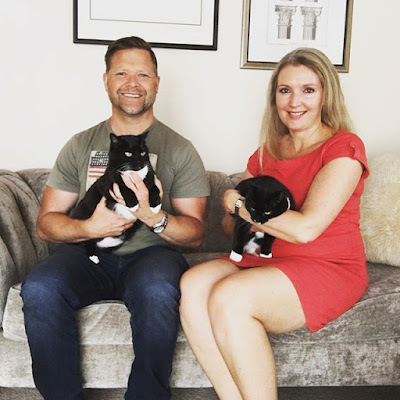 Fiona, you look beautiful and you have such a handsome husband - and adorable kitties! Merry Christmas and thank you for the marvelously inspirational books you provide. Good luck with your upcoming move - I affirm that your house sells quickly and for an excellent price! As someone who is just settled into her new home as a stay-at-home wife I know you are going to love your new impending life! Hi Fiona, What a good looking couple you make! It's funny, I have never checked out your Facebook page or watched your YouTube channel until now; I've always just visited your blog! I'm glad your books are doing well - we do need to spread the chic word :) Thank you for that. I hope you and Paul have a Christmas full of love, joy and peace. Thank you for another year of inspiration. It's my pleasure, D. Thanks so much for being lovely! 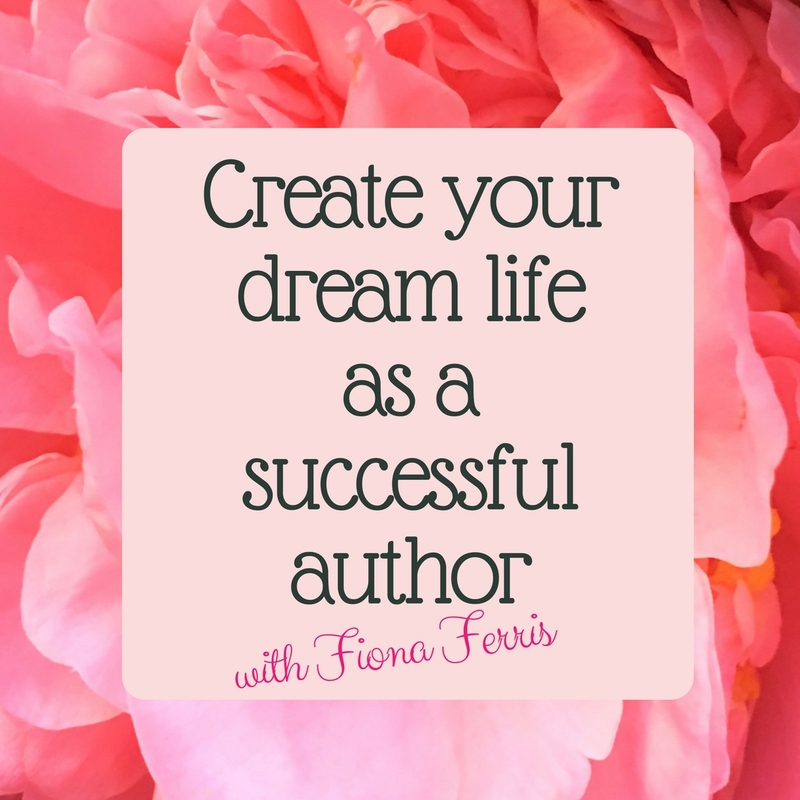 Thank you for all your encouragement and inspiration in 2016, Fiona. I have spent a lovely morning with your blog. 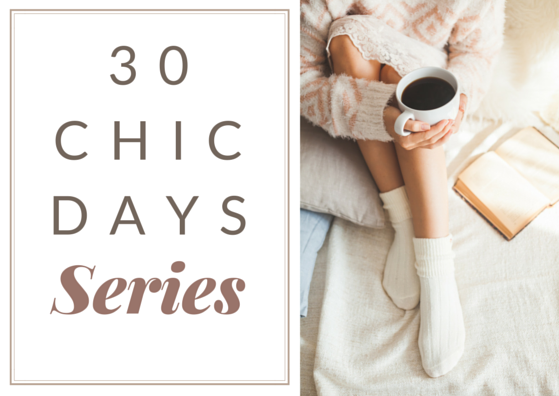 I have chosen to repeat each of the "30 Chic Days" series in 2017. The first month of each quarter will be Chic month. I have written a single tip, idea or inspiration into each day of my planner. It will be the first thing I see every morning. I'm excited about the possibilities. I somehow lost my 2016 planner in mid November and my productivity and focus have plummeted. Time to get back on track. With your help, 2017 will be the best year ever! Thank you again, I wish you and Paul all the best in your new life. You are such an inspiration for making dreams come true. Hi Kerry, what a fun idea. 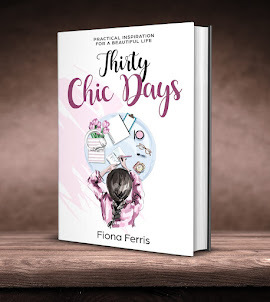 Sometimes when I read a post of mine from a while back I forget what I've written, so it's new to me too :) Maybe I should go through each 30 chic days series. I love your quarterly chic month! So inspired. What an excellent photo of you, your husband, and your kitties. Your blog and videos have been very inspirational these past few months,(since I discovered your site) and I plan to continue to be inspired by them in 2017. Best wishes for a very Happy New Year to you! I love the photo of you with your lovely Tuxedo kittens! We have a rescued kitty girl, Piper, who is also a Tuxedo Cat! Hi Gwyn, happy new year to you and Miss Piper!